There are a lot of marketing materials that go into a tradeshow. While it's important to make your business stand out from the crowd at such a big event, it's also important to keep all of those marketing materials organized. Velcro and magnetic tape. Regular tape won't help you keep your marketing materials from sliding around on your table. Velcro and magnetic tape ensures everything stays where you need it to whether you're hanging a banner or displaying posters. Display lighting. 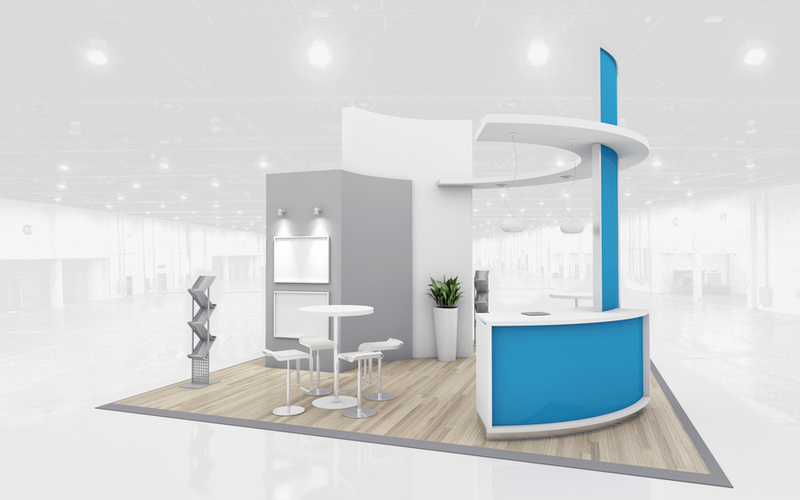 You can have the best-designed tradeshow booth at the entire event, but if your consumers can't see the display then that incredible design won't matter. Display lighting gives you the boost you need to make sure your business is visible from across the room. Shipping cases. You need to get your tradeshow booth to the event somehow. Shipping cases keep everything together and prevent your booth from getting damaged on the way. Table covers and runners. You have a tradeshow booth, a banner display, and tabletop displays. But your booth can still look unappealing without a table cover. Use a table runner with your branding to bring your whole booth together. Flag accessories. Flag accessories help to keep your flag display upright and easy to see for consumers both near and far across the room. Carry bags. You don't always need a shipping case to carry your tradeshow display. For the displays that are on the smaller side, carry bags are comfortable and simple solutions to keep your display and supplies organized. What's more, carry bags come with shoulder pads and easy-to-grip handles, so you can be sure you're comfortable carrying your equipment both to and from the tradeshow. Looking for professional tradeshow booths for your next event? Tradeshows can do a lot for your business. In fact, up to 79% of consumers said they researched a brand after they'd received a promotional product. But before your consumers can research you, you need to get their attention. Anything Display offers a variety of tradeshow booths, tabletop displays, and retractable banner stands so you can maximize your tradeshow experience. To learn more about our tradeshow booths, displays, and accessories, contact Anything Display today.